Alexis has been absorbing and performing music all her life. An environment of creativity surrounded her as she grew up with her mother, Bobbie Antes, an accomplished singer/songwriter and musician. By the age of twelve, Alexis had taught herself to play the guitar. At eighteen, she was the youngest founding member of the popular and influential Cleveland-based folk-pop group, Odd Girl Out. After OGO split, Alexis found her own voice and a new path as a writer and performer of her own songs. Cleveland’s Scene Magazine said of her work, “Listeners are treated to a lone voice in the wilderness singing introspective, soul-searching ballads about disillusionment, heartache and growth — songs that would not be out of place on a disc by Paula Cole”. 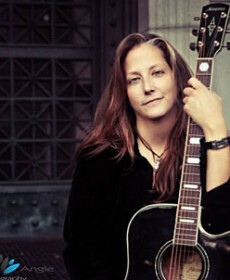 To read more about Alexis or to hear some of her music, go to www.alexisantes.com.